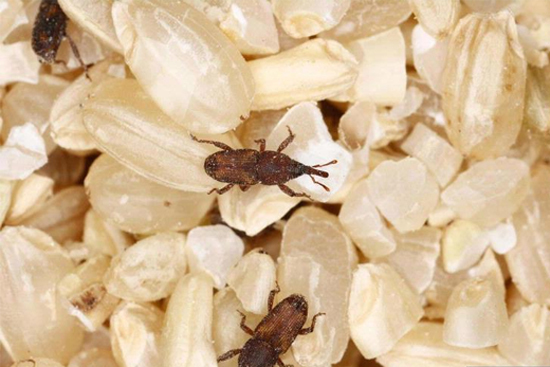 The rice weevil (Sitophilus oryzae) is a serious stored product pest which attacks several crops, including wheat, rice, and maize. 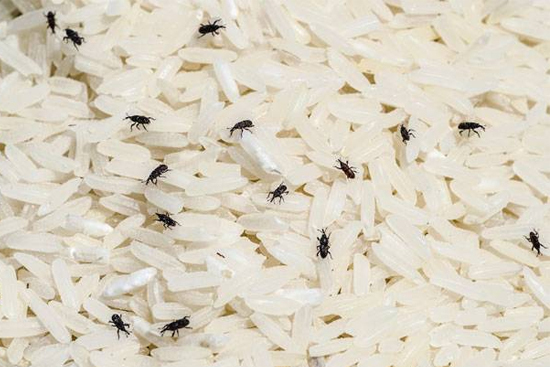 Adult rice weevils are able to fly, and can survive for up to two years. Females lay 2-6 eggs per day and up to 300 over their lifetime. The female uses strong mandibles to chew a hole into a grain kernel after which she deposits a single egg within the hole, sealing it with secretions from her ovipositor. The larva develops within the grain, hollowing it out while feeding. It then pupates within the grain kernel and emerges 2–4 days after eclosion. An adult emerges from inside a grain of rice. The key to control is proper identification, a thorough inspection, good sanitation, and pesticide application when required.